Tigercat says that it noticed a void in the marketplace as equipment manufacturers for the most part have stopped producing and supporting steering axle-equipped, self-propelled loaders for millyard applications. So it has stepped up with the newly designed AC16 articulating carrier. The AC16 can be mated to a Tigercat 234 or 250 series knuckleboom loader. The AC16 is four-wheel drive unit with powerful tractive effort for towing applications and tough terrain log yard conditions. The durable carrier is completely fabricated by Tigercat and uses robust forest-duty components that are standard equipment on many Tigercat machines. 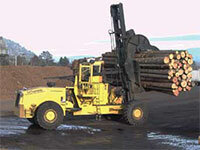 The axles, brakes and transmission are common to Tigercat drive-to-tree feller bunchers. Optional circle saw slasher hydraulics are available, and Tigercat will also be offering an optional log bunk. The loader can be separated from the carrier if required. The prototype unit was purchased by Verso Paper Corp and has been operating successfully in a wood yard in Dover-Foxcroft, Maine since mid-2012. The 830 M-T log loader and stacker builds on Sennebogen’s global experience in logging applications to provide a purpose-built, log handling machine specially engineered for pulling heavy trailer loads. Powered by a 224 hp Cummins diesel engine, the four-wheel-drive system features dual transfer transmissions providing direct drive to each axle. Said to have the highest drawbar pull in its weight class, the drive system ensures ample power to pull 100,000 lb trailer loads without undue stress on the power train. The 830 M-T undercarriage is also specially reinforced for towing stresses. Sennebogen’s hydraulic elevating maXCab, standard on the 830 M-T, can rise up to 20’ above ground level, allowing the operator an unobstructed bird’s eye view for efficient high stacking. With its latest E series upgrades, Sennebogen is introducing Tier IV-compliant models of the 830 M equipped with a fuel saving “Eco-Mode“ and no-load automatic stop function. Loggers can load, deck and sort logs with a complete line up of Cat wheel loaders equipped with Cat log handling work tools. Caterpillar offers a wide range for precise matching to applications from the 141 hp Cat 924K to the 501 hp Cat 988H. Operators can change most tools from the cab in less than 30 seconds. Small and midsize wheel loaders, including the 938K, are equipped with the Cat Fusion Wheel Loader Coupler System, which pulls the coupler and work tool closer to the loader, moving the centre of gravity inward and increasing the lifting ability compared to other coupler systems. The Cat M325D LMH wheeled material handler, which can tow its own trailer, is purpose-built for unloading trucks, high decking and loading the mill infeed. The operator can select the Heavy Lift Mode at the push of a button to boost lifting capability of heavy loads while maintaining control and stability. The hydraulic cab riser elevates to 2.6 m for maximum visibility on all sides. The Tanguay WL350 is a 75,000 lb loader equipped with a Cummins QSB, 6.4 litre engine rated at 225 hp. Designed and built in North America, the hydraulic and electrical components are easy to find. The Tanguay WL350 features a Funk transmission and provides 100,000 lbs towing capacity. The state-of-the-art hydraulics provide smooth and fast boom movements and are incredibly stable, with full lift capacity over 360 degrees. It comes with electro-proportional controlled hydraulic cab riser, rear entrance ergonomic cab and excellent visibility with the operator’s eyes at 18.5’. It has boom reach up to 44’ with configurations and grapple options to handle all types of sawlogs, tree length logs, wood chips or scrap materials. Tanguay also offers custom electrical power pedestal and rail mount loaders to suit mill requirements. LeTourneau Technologies is providing a solution to the forest industry’s cut-to-length (CTL) operations with the introduction of the model 3594, 35-ton, four-wheel-drive, short log stacker. The 3594 is quick and nimble in the log yard, performing many log handling functions, such as off-loading, roll out, decking, reclaim and feeding the mill. 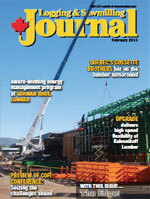 LeTourneau continues its efforts to improve production and functionality of its log stackers in any log yard. The machine’s maximum travel speed has increased by 17 per cent to 14 mph, and attains that speed 50 per cent faster. The hoisting speed is 100 per cent faster at 60’ per minute, compared to 30’ per minute. Cycle time has improved 80 per cent through increased hoist and grapple speed. In addition, the optional 101 or 124 cubic foot grapple system allows single pass unloading on highway or off, even for crowned loads. The machine is very stable in muddy yards, and the unique design gives it a firm footprint to perform all functions. High decking is advantageous with the machine’s 24’ lift ability, minimizing the need for extra equipment. Liebherr has introduced a new product for operation in the timber handling sector: the L580 LogHandler. The newly designed Liebherr lifting gear enables timber to be moved from above at a great height, which makes the LogHandler particularly well suited for work such as the loading and unloading of trucks or feeding bark removal and sorting installations. The grab can be rotated through 360 degrees as well as pivoting forwards and backwards. The driver’s cab is designed with advanced ergonomics. The L580 LogHandler also comes equipped with a continuously variable Liebherr driveline for uninterrupted driveline force. Compared to conventional transmission, the Liebherr driveline achieves a reduction in fuel consumption of 25 per cent or more, the company says. All the materials used in the Liebherr LogHandler have passed long term tests in log yards to ensure that they match up to Liebherr’s exacting standards, even in the toughest conditions. Liebherr says its concept and proven quality make the L580 LogHandler a benchmark for reliability. 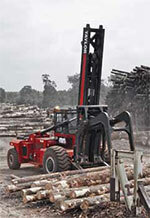 Taylor Machine Works TLS series log stackers are used extensively in today’s forest industry, the company says. Known for their rugged dependability, Taylor offers three models to choose from, each capable of handling a full log load from truck or rail in a single pass. All models are built on an all-welded, high strength steel chassis and frame with an ergonomically designed operator station mounted in an offset position to provide better visibility over centre-mounted models. Three models are in the TLS series, all with 48” load centres. These are the TLS-800 with 80,000 lbs lift capacity and 243” wheelbase; the TLS-900 with 90,000 lbs lift capacity and 288” wheelbase; and, the TLS-1000 with 100,000 lbs lift capacity and 288” wheelbase.